With just a mobile cart selling tea, juice, coffee and snacks on Marina beach and earned 50 paisa a day, this ‘FICCI Woman Entrepreneur of the Year 2010’ award winner is a true inspiration. Left home at the age of seventeen to marry a person from a different religion, Patricia Narayan has overcome many obstacles in life. Her marriage to Narayan failed as he was a drug addict and never helped the family. Later on her husband left the family and disappeared, and eventually died. Patricia Narayan started her business when she borrowed some money from her mother and started making squashes, jams and pickles at home. Her mother would take them to her office and sell them off to her colleagues. This boosted her confidence. Coming from the family of government servants, never had she imagined to shape into a business woman. On June 21, 1982, she took her mobile cart to the beach after patching a deal with her father’s friend, who ran a school for handicapped children and was giving out free mobile carts to people who would employ at least two handicapped people. Patricia Narayan happily accepted the terms and started her business. The first day at the beach was a terrible failure as she sold only one tea for 50 paisa. But she didn’t give up, and instead braced up and went back the next day, and that turned out to be a hit. Her business began catching popularity and she was also offered to work in canteen of a office in Chennai. 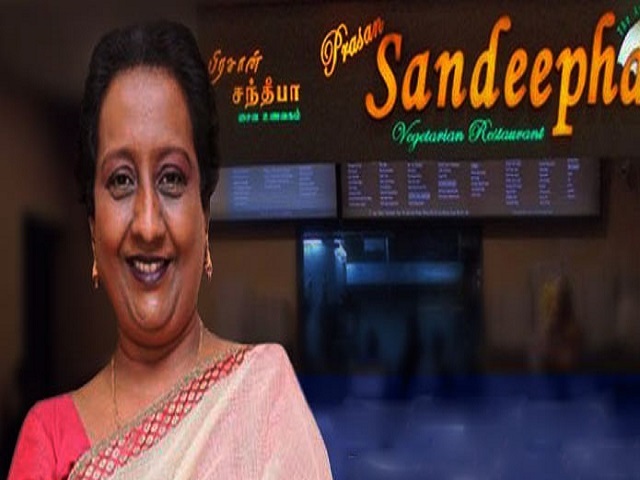 In 1998, she became the director of Nelson Manckam road restaurant. When her career was going on very well, in 2002, Patricia Narayan lost her daughter and her son-in-law in an accident just after a month they had got married. This incident shocked her that she was unable to get over it. She was devastated over her daughter’s death and was shocked even more when she saw how the accident victims were treated by the ambulance operators. In memory of her daughter, Narayan and her son soon started a brand of their own named after the deceased – “Sandeepha”. Since then, she has gone on to devote all her time to building and nurturing her restaurant and making it bigger and more popular than ever. Patricia Narayan has come a long way and become the person that she is today because of her hardwork and determination. She is an inspiration to those who wish to make a difference. In 2010, she was awarded the ‘FICCI Woman Entrepreneur of the Year’. What more to ask for? She has seen and done it all.